Once again, Wellington has a lucky escape and shows its resilience, by shrugging off what could have been a serious earthquake. As it is, the damage suffered is very light in Wellington, although more serious in Seddon. 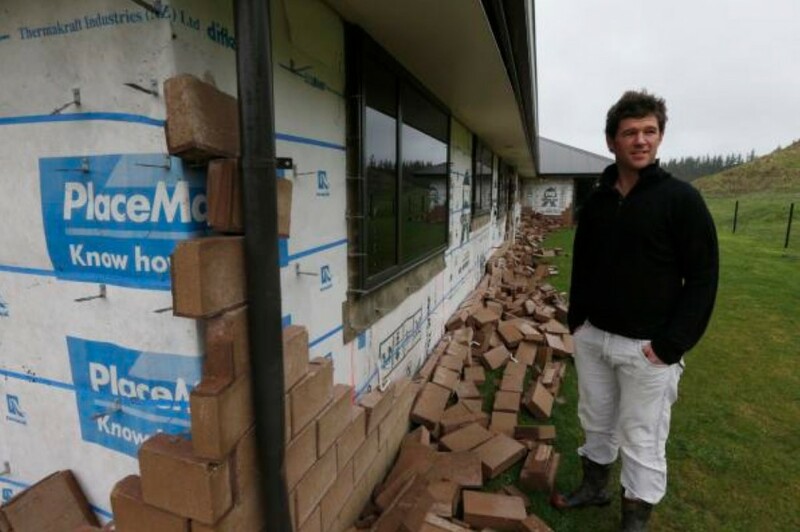 This photo typifies the damage apparent on at least one brick-clad Seddon house. Yes, an earthquake is an Act of God, but actually: what really is wrong with this picture? Is it the white pants? is that what’s wrong with it? ten points to Gryffindor, thank you Joanna. Never wear white pants outside when there is a chance of rain. Anything else? Well, personally, i take exception to the tucking in of the trousers into the gumboots, but I guess that’s not quite what you are after either? Is it the fence? Never install a 5 wire fence on steel posts without a gauge strainer for back tension? The bricks should be on the wall of the building, not the ground…? No enough clearance between the cladding and the path? Is it building a brick path directly on the grass? You should dig the grass up first then compact a layer sand for a level brick surface. Some decent edging would help too. In any case, looking at the proportions..they look more like pavers rather than bricks. Very droll, the lot of you. I was waiting for 60 and Starkive to put in their 2c worth of sarcastic replies as well…. But yes, Peter, James, John, and m-d have all correctly identified that the bricks are the issue. And, sardonic or not, I think you’ve all correctly noted that the shape, size, and orientation of the bricks used are completely wrong. They actually are brick pavers, or at least they are a shape more suitable as a paver, and they’ve been laid completely wrongly as brick veneer – bricks should be wider than they are taller – and it looks like there is bugger all decent mortar in those joints as well. That’s the most crap bit of brick-laying I’ve seen in a month of Sundays. And that Placemakers sign “Know how. Can Do.” clearly that’s wrong as well. Know Nothing. Cannot Do. Is a far better slogan for them. A pretty good argument for the House of Sticks, I’d have thought. No no, come on, jump in…. The water’s fine…. Its just… It’s just that… I mean, Placemakers are 100% fully owned by Fletcher’s, our country’s biggest and supposedly best building contractor, and they let people build with pavers instead of bricks? What hope has our country got if this is standard practice? I’m speechless. Whether they look any good, is a personal choice, but it is not a case of some young salesman at the local Placeys saying I can save you some money by substituting these paver blocks for those expensive bricks on you schedule…. Technically, the brick ties failed to do their intended job, which they should have done. They look like they should be ‘fishtail’ ties but the ends are flat and therefore would never have worked even if they were put in properly. There appears to be insufficient ties (an old check in the UK was to put your arm in the cavity and swing it through a half circle – if you touched nothing, the wall was condemned) especially under the window. Brick houses should have stayed in The Old Country. It is surely time to rethink the codes on brickwork as this is so typical of what happened in Christchurch also… plus they’re ugly. The size and shape of the bricks doesn’t matter. We just shouldn’t be building anything in NZ in brick at all. It’s like they saw half of Christchurch’s buildings lying in piles on the street and thought “you know, I could build one of those too”.